However, I recently met an issue with this behaviour, where the CRM Asynchronous Service appears to get in a state where all it is doing is deleting completed jobs, to the exclusion of all other activity. This can leave the CRM Asynchronous Service to have effectively hung (not responding to service control requests, nor polling for new jobs to process) and not to process any new jobs for a considerable period of time (in one environment, this could be several hours). At the moment, the only workaround I have is to remove the registry values, and to use a scheduled SQL job to periodically clear out the asyncoperationbase table. Here is an example of such a script. This is is common requirement, and I've never found what I consider to be a suitable explanation of what needs to be done. This post is not intended to be exhaustive, but is intended to cover the essentials in one place. This is relatively easy to achieve when opening the page from within CRM (i.e. in an IFrame, via an ISV.config button or in client script). In each case you can use the PrependOrgName global function in client script - e.g. However, this does not always do what some people expect. CRM has 2 distinct concepts of a 'Default Organisation', and only one of them can be set using Deployment Manager. The 'Default Organisation' that you set in Deployment is a system-wide setting whose primary use is to define which organisation database is used by code that accesses CRM 4.0 through the CRM 3.0 web services (CRM 3.0 did not support multiple organisations, so the web services had no way to specify the organisation to connect to). The other type of 'Default Organisation' applies to users. Each user has a Default Organisation, which is the organisation that they are connected to if browsing to a Url that does not contain the organisation name. For example, if a user browses to http://crm/Excitation/loader.aspx, then the user will necessarily be taken to the Excitation organisation, but if they browse to http://crm/loader.aspx, they will be taken to their default organisation, which has no relationship to the 'Default Organisation' that is set in Deployment Manager. Each user's default organisation will be the first organisation in which their CRM user record was created. One issue that can arise is if a user connects using a Url that does not contain the organisation name, and either their default organisation has been disabled, or their user account in their default organisation has been disabled. In this scenario, the user would receive either the error 'The specified organization is disabled' or 'The specified user is either disabled or is not a member of any business unit'. The simplest solution would be to specify an appropriate organisation name in the Url; however if this is not possible, the rest of this post describes an unsupported alternative. The DefaultOrganizationId field in SystemUser defines each user's default organisation, and this can be joined to the Id field in the Organization table. So, that's how it fits together. As this is all SQL data, it is not difficult to modify this, but be aware that to do so is completely unsupported, and could break your CRM implementation. If you were to make any changes, make sure you backup the relevant databases (especially MSCRM_Config) before you do so. If you did want to change a user's default organisation, please heed the warning in the preceding paragraph and backup the MSCRM_Config database. The following SQL update statement will change the default organisation of a given user, based on their systemuserid in one organisation database. The reason for writing the query this way is to ensure that a user's default organisation can only be set to an organisation that they exist in, and this query should only ever modify one record. If it modifies 0 records, then check the @systemuserid value, and if it modifies more than one record then your MSCRM_Config database is probably corrupt, and you should reinstall CRM and reimport your organisation databases (I was serious about my warnings). One final point; CRM caches some of the data in MSCRM_Config, so you'd need to recycle the CRM application pool to sure any changes have taken effect. The Dynamic CRM Connector for Reporting Services is a very useful component that avoids the need to configure Active Directory delegation (aka double-hop authentication) when multiple servers are used for the CRM, Reporting Services and SQL Server roles in a CRM implementation. In general, it is easy to install and use, but I'm always interested in how these things work. MSCRM Data Source using the CRM extension after the connector is installed. These 'credentials' are not what they seem; rather they are a cunning way for the CRM platform to pass information about the current user to the CRM connector. The CRM connector expects the current user's systemuserid (a Guid) to be passed into the Log In Name box, and the organizationid (another Guid) to be passed into the Password box. These are not your login name and password. One use is for troubleshooting. 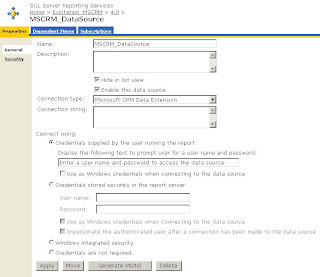 Checking the rsreportserver.config is a quick way to see if the connector is installed, and checking the configuration of the MSCRM Data Source will tell you if the connector is in use. 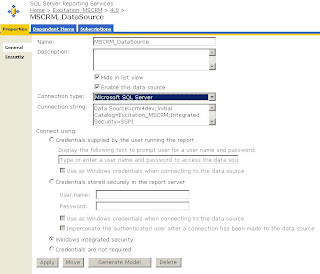 Changing the MSCRM Data Source is a quick way to turn the connector on or off for test purposes. You can also run the reports directly, rather than from CRM. Again, when troubleshooting I find it useful to run a report directly from Report Manager web interface. To do this with the connector, you need to enter the systemuserid and organizationid when prompted (see image above). These values can be read from the filteredsystemuser and filterorganization views respectively in the MSCRM database. For no.s 2 to 4 I've not given a way of clearing out space, as this would involve deletion of business data. Bubbling something up from an answer I gave on the Dynamics CRM forums. Although it may not seem obvious within Advanced Find, it is possible to create a view that displays records owned by a user's business unit. The CRM 4.0.12 SDK has recently been released. Normally an SDK update is not particularly significant, but in this case it includes some major enhancements, which come under the banner of 'Advanced Developer Extensions'. David Yack has already posted a quick how-to on the CRM Team Blog; rather than duplicate that, this post is intended to cover the scope and limitations of the new extensions as I see them, and how they differ from the original CRM programming model. What are the new extensions ? It seems to make sense to split the new features into 2; the 'Advanced Developer Extensions' (whcih has been helpfully shortened to Microsoft xRM), and the Portal Accelerator (aka Portal Developer). The Portal accelerator uses Microsoft xRM, but I think it is otherwise best treated separately. So, for this post I'll concentrate on Microsoft xRM. Although Microsoft xRM appears to provide a whole new programming model, it can be considered as essentially a (rather big) wrapper around the existing SDK assemblies (microsoft.crm.sdk and microsoft.crm.sdktypeproxy). So, although your code would not directly use the classes in the SDK assemblies, the communication with CRM is still ultimately done via the CRM web services, and is subject to the same limitations (e.g. limitations of the FetchXml query syntax). Another consequence of this is that you do not need to change any of your network configuration to use these extensions. As with the SOAP web services, you can use strongly-types classes for system and custom entities. Superficially the process for setting this up differs from the SOAP web services, although the underlying idea is pretty similar. With these extensions, you use a supplied tool (CrmSvcUtil.exe) to connect to a CRM server. This tool will generate the class definitions for all CRM entities into one output code file which you'll add into your .Net project. Ultimately, this process is very similar to what happens behind the scenes when you create a Web Reference to the SOAP web services. The main internal difference is that the generated classes with these extensions maps down to the DynamicEntity class, but this is hidden from you. You can still use a generic class with these extensions rather than strongly-typed classes. With the extensions it is ICrmEntity, rather than DynamicEntity. Native .Net Types are used instead of Crm-specific types. The extensions use the nullable versions of the types (e.g. int?, rather than int) so that you can still identify null values (which was one of the main original reasons for the Crm-specific types). For picklist and status attributes the extensions provide an additional Label attribute (e.g. customertypecodeLabel) with the appropriate text, whereas for lookup attributes you can get the related entity via a property that has the relationship name (e.g. price_level_accounts). This replaces the need for the CrmService instance, and handles the selection of authentication type, passing credentials and management of the CrmAuthentication token. All connection-related information (server URL and port, organisation name, authentication type and credentials) can be specified in one connection string. The extension code includes logic to read connection string information from the application config file. Overall, this should greatly simplify deployment across different environments and authentication types. The DataContext exposes an IOrganizationService instance, which looks to combine the underlying ICrmService and IMetadataService instances. This allows use of any of the more specific CrmService messages (e.g. InstantiateTemplate), or MetadataService messages. Interestingly the constructor for the DataContext can take an IContextService or IWorkflowContext instance, but not an IPluginExecutionContext instance. This implies that the extensions can work within a custom workflow activity, but are of limited use within plugins. See below for more on this. I've not looked at this in great detail, but I see the greatest benefit is the simplicity of retrieving related records with methods such as GetRelatedEntities to get child and many-many entities, and GetRelatedEntity to get a parent entity. Again, not an area I've spent much time with. In the first instance I see this as most useful for developers that are already familiar with the LINQ query syntax, but I generally encourage the use of standard technologies (such as LINQ) in preference to application-specific technologies (such as QueryExpression). My expectation is that you should expect developer productivity gains with use of LINQ instead of QueryExpression, but I've not spent enough time on this to get good metrics. It should be emphasised that the LINQ query ultimately maps down to a QueryExpression, and hence you are as limited in the scope of queries as you currently are. There's a lot of very good stuff in the areas mentioned above, which could have significant benefits on developer productivity. However, I don't think you can immediately replace all existing .Net code (even if you wanted to), as there are some areas that I don't think these extensions reach (yet?). Note that the following list is based on my investigations so far, and may include features that do exist, but which I've missed in my brief analysis so far. My understanding is that these extensions originated as a basis for developing portal-style applications against CRM, so in that context it is not at all surprising that there are areas where the code can't reach. It'll be interesting to see how this changes, both with CRM 4 and CRM 5. What next, indeed. The timing of this release is interesting, coming relatively late in the life of CRM 4 as the most recent version of CRM. It's still a little too early to know what will happen with CRM 5, but it would be logical to expect that these extensions will continue to work with future versions of CRM. The more interesting question is whether we will continue to have more that one programming model for CRM 5 (e.g. a native interface, and extensions such as these which form a wrapper around the native interface), or whether these 2 models will start to merge together. Over time I've been asked to review various existing CRM implementations. One thing I often like to check is whether there are any attributes that are not in use. To this end I created the stored procedure at the end of this post. The stored procedure lists the attributes in an entity along with how many records contain data in that attribute. The parameters in the procedure allow you to limit the attributes to custom attributes, and to specify a maximum count of values (above which the attribute data won't be output). I've recently been working with CRM and Reporting Services in environments where AD delegation has been required, and hence it's been important to configure Service Principle Names (SPN). A good overview of SPNs and how they are set can be found in this document for CRM 3. 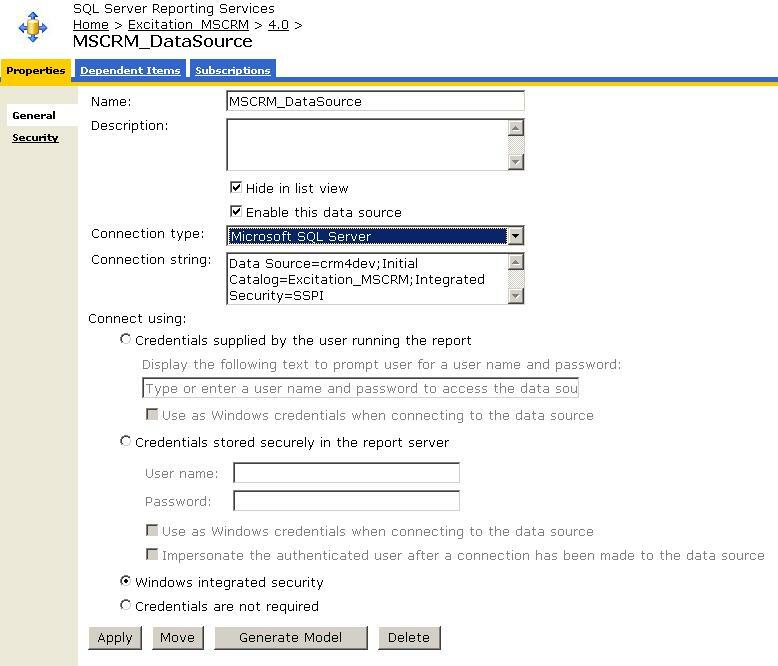 Although some of the steps in that document have been superseded by the use of the CRM 4.0 Reporting Services connector, the document is still a good reference for the main aspects of setting up SPNs. There are two further considerations that are not covered in the above document though; ensuring Kerberos is used, and getting permission to modify SPNs. There are 2 Windows authentication mechanisms: NTLM (aka Challenge/Response) and Kerberos. Only Kerberos supports delegation. By default, Kerberos will be used if the client supports it (this setting is known as 'Negotiate'), but this behaviour can be changed. For web applications hosted in IIS (such as CRM and Reporting Servers 2005), this is controlled by the NTAuthenticationProvider setting in the IIS metabase. Note that this can be set at a few different levels, and you'll need to check them all to determine the current configuration. When you install CRM, the Environment Diagnostics Wizard requires that Negotiate is the default setting, though it could have been changed after install. 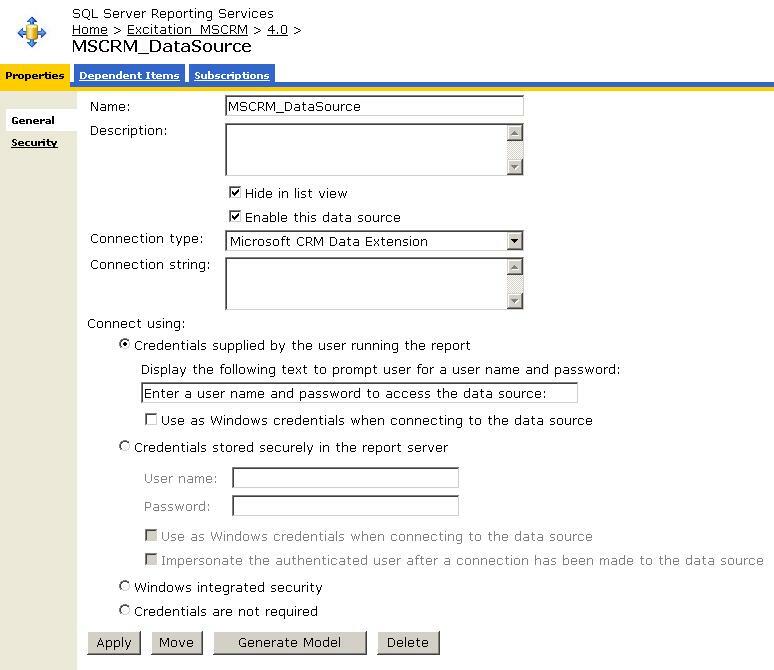 Reporting Services 2008 does not use IIS, and the authentication settings are configured in the rsreportserver.config file. Information about these settings can be found here in SQL Server 2008 Books Online.